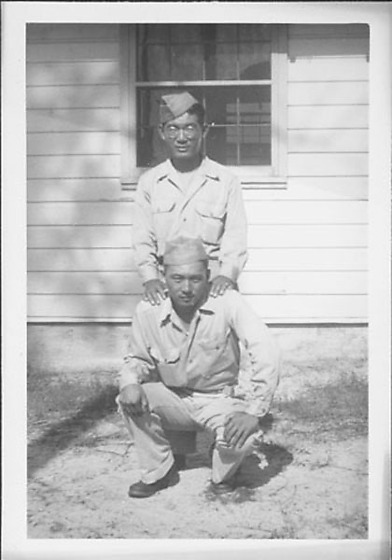 Two men in United States Army uniform pose in front of exterior wall of building, October 1944. Facing the viewer, soldier in eyeglasses stands with hands on shoulders of soldier crouching in foregound resting hands on knees. Both wear light colored uniforms with garrison caps. Closed window is directly behind them at TC. Gray along TR, B, BR edges. Stamped in black ink on back: OCT 1944.